If the sounds of bellowing, fast passed, heart pumping, up-close and personal encounters are your thing, then hound hunting may be in your wheel house. For hunter James DeVoglaer the concept of hunting with dogs is nothing new. Being an avid bird hunter his love for hunting behind man’s best friend is well established. Nonetheless, after his first trip to British Columbia to hunt black bears, I believe it is now safe to say he is also hooked on hunting bears with hounds. This is his story. “To properly tell this tale we need to rewind back to February 2014, my first adventure at Skinner Creek,(www.skinnercreekhunts.com),” starts DeVoglaer. “I was there to pursue mountain lion and lynx. My preferred style of hunting is fast passed and up close, but for most the idea of trudging miles through snow in subzero temperatures would not be appealing. Yet as a former U.S. Marine high-output hunts are exactly what I like and this hunt proved to be no exception. 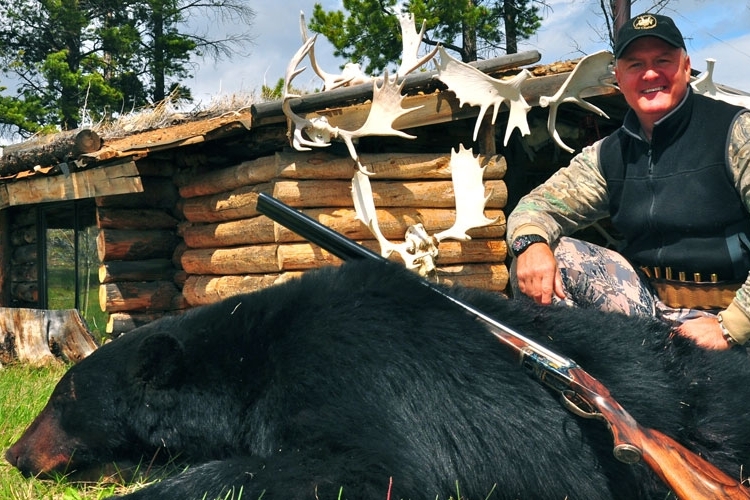 “After taking a massive mountain lion and above average lynx with my Heym 450/400 double rifle, outfitter Doug McMann pulled me to one side, and said ‘If you loved this, you have to come back in the spring for black bear.’ I readily agreed, and after returning home, my dates were selected and the hunt secured with a deposit. I planned a five day spring bear hunt with what would soon be my newly acquired Heym 577 double (http://www.heymusa.com/) and could not wait to get back to British Columbia to try it out. “When my flight landed at Williams Lake, British Columbia, I was greeted by Doug McMann. The weather was lousy, but we proceeded our way to camp, roughly a two hour drive, where we caught up on family and discussed the upcoming week’s hunt. It has been said that hunting with McMann is like being part of the family. “About 45 minutes after at arriving camp it was time to hunt! The dogs were collared up and ready to work. Within 20-30 minutes the dogs caught a scent and had a nice boar treed two miles from camp. What a great way to start the week! It was a small boar so we opted to pass, though it was a great example of the typical bear hunting conditions of British Colombia: Heavy blow downs and lots of huge mosquitos. If I told you how big they were you would not believe me! 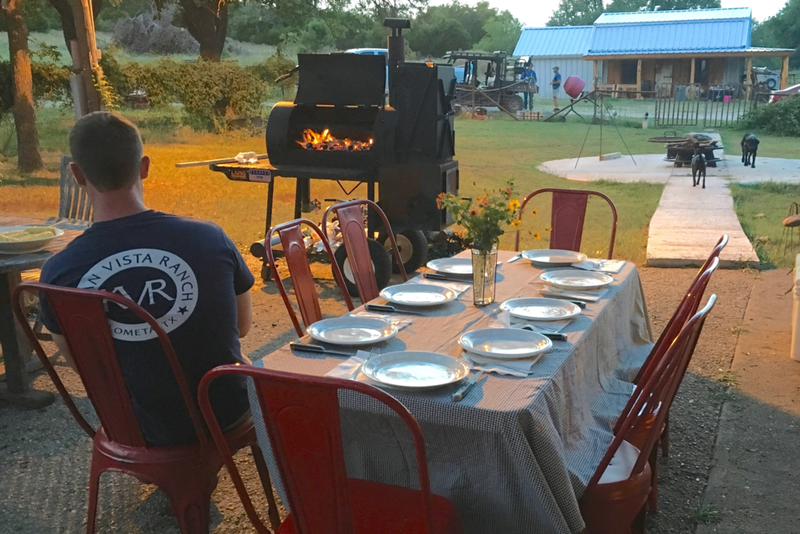 We wrapped the evening up with a wonderful meal and then watched as it continued to rain steadily. It looked like it was going to be a tough week of bear hunting. A typical morning: Early rise, breakfast by seven and then out the door with the dogs loaded up and working by eight. There was no activity by mid-day so we took a break from the mud and rain. Then with the dogs working the rest of the afternoon we hit a scent at 9 o’clock, and with what I like to call a recon shuffle, we found ourselves running down hill and then back up hill to catch up to the dogs. By the time we finally got to the dogs it was too dark and pouring rain so we called it a night. We were back at camp by 11:30. Another typical morning: We were out the door by eight and within 50 minutes the dogs had caught a scent and had the bear treed 15 minutes later. It turned out to be a young boar which we guessed to be three years old. We passed. Doug’s daughter decided to come along for the afternoon hunt which seemed to help as we had another small boar treed in a short amount of time. Again it was too small so we opted to pass it up. With the heavy rains continuing we decided to try a different approach spending the remainder of the evening trying to spot and then stalk a bear. It was not productive. Finally the rain subsided and we were hopeful this would get the bigger boars moving. We free-casted the dogs in a known bear feeding area, and kept a watchful eye on the GPS collars We could see the dogs in a pattern of being bayed up, and then they get into a fight and then they bayed up again. After the dogs went in different directions we picked up the first three dogs while the others dogs continued after the bear. According to the GPS they went more than 20-plus miles! We finally found the dogs in a creek near a bog and headed back to camp. Doug believed the dogs got on the track of a grizzly which will just run. We got some fresh dogs and soon had another small sow treed, though this was unlike the other bears we treed. She was pissed, popping her gums, growling, I was happy she strayed in the tree. We backed out and the dogs jumped another sow which again we passed. Already having quit an eventful day we caught another track later in the evening around 7:30. Within a few minutes the dogs showed a solid bay, and with the commotion loud and furious we had high hopes! Well it seemed the break in the weather was short as we soon had constant rain and wind gusting between 30-40 mph. The morning was tough hunting. The dogs hit six solid strikes on scent, but with the heavy rains and wind they were unable to get a track. The afternoon provided the same conditions with the dogs getting on the track of a young boar and the chase was on, but by the end of the day we were again unsuccessful. Who says hunting with hounds is easy? Well it was our last day and it was time to get it done. Doug and I headed off to an area which has a trapper’s cabin. While changing the batteries on my hearing protection a big boar ran across the road. Game on! Getting the dogs out, they had this bear treed within a few minutes. After a quarter mile hike downhill the boar was dumped out of the tree, hitting the ground like he was on springs. I quickly fired another Woodleigh soft through his shoulders which rolled him having him come to a stop in a heavy thicket. As anyone knows going downhill is great but getting dead weight up hill is never easy. The rest of the day was spent enjoying the scenery and settling out. If anyone is looking for both a physical challenging and exciting way to hunt, book your next hound hunt with Doug McMann at Skinner Creek. I am already planning to take my daughter touting her 375 Flanged Heym next spring. Click here to see the hunt.